A 13-year-old boy born to consanguineously married (first-degree relative) parents presented to Dermatology outpatient department with complaints of recurrent episodes of skin lesions and difficulty in lifting the right foot since 1 year. Patient had numbness tingling with hypoaesthesia, clinically diagnosed as mononeuritic multiplex of right common peroneal nerve of the right lower limb. He also had complains of unilateral joint pain, gives history of recurrent episodes of rash with fever, complains of mild degree of photophobia. There was no history of nystagmus, drug intake, mucosal involvement, or other relevant complaints; there was no history of Herpes simplex or other exanthemas. On examination strikingly, the hair over the entire body and scalp was silvery in color including eyelashes and eyebrows [Figure 1]. Patient had Photo tanning with freckles over the face and other exposed parts. 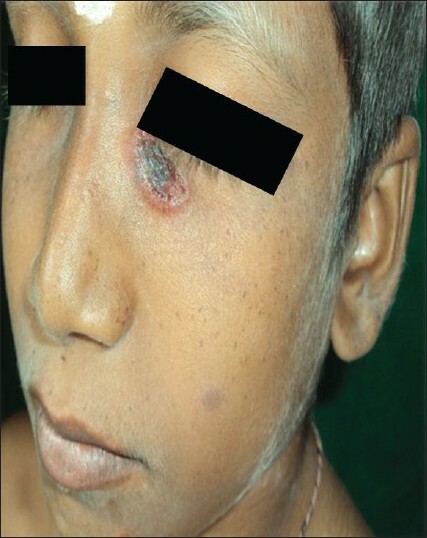 Solitary annular ulcerated plaque with crusting in the center with beaded borders was seen over the left infraorbital region, clinically resembling basal cell carcinoma [Figure 2]. Target lesions were seen over the face and upper trunk. 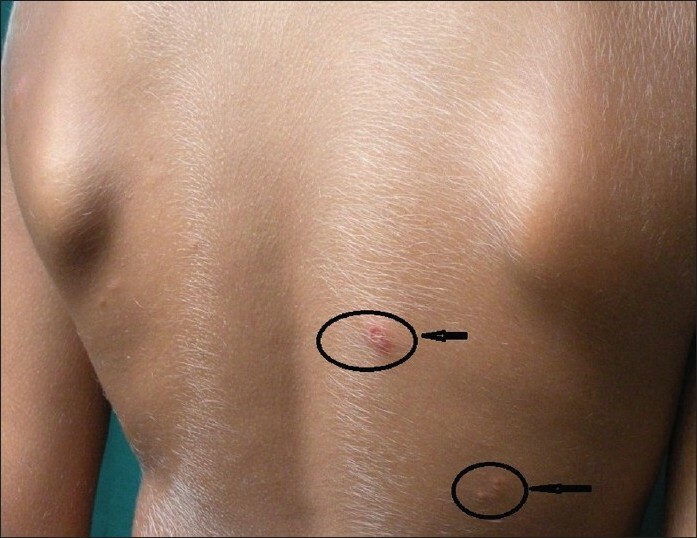 A clinical diagnosis of Erythema multiforme (EMF) minor was made [Figure 3]. Patient also had associated stunted physical growth. Visual acuity was normal. Patient presented with recurrent eruption of vesicles and target lesions with fever without any drug intake or preceding or associated herpes virus infection, but exact cause for the recurrent infection could not be identified but thought to be due to recurrent bacterial infections as each episode responded promptly with a course of antibiotic and symptomatic treatment without systemic antiviral therapy. On subsequent visits, he also presented with hyperesthesia and tingling over left trigeminal distribution and pain on the left side of the face. Ear, nose, and throat examination revealed normal external auditory canal and tympanic membrane but diminished auditory capacity in the left ear. Pure tone audiometry of the left ear suggested 95% sensory neural deafness. However, the complaints of numbness, tingling, and hypoesthesia over the right common peroneal nerve area on the right side, which he initially complained, had improved without any significant medical or surgical intervention. The ulcerated, annular lesion over the left infraorbital region had healed spontaneously on treatment with oral and topical antibiotics, without much scarring bur with formation of milia. Patient has been on regular follow-up till date, with history of recurrent episodes of erythema multiforme and mild low-grade fever and deafness of the left ear. On investigation, peripheral blood smear was normal; no prominent granules were seen in the leucocytes performed at each visit for six times in the last one year. 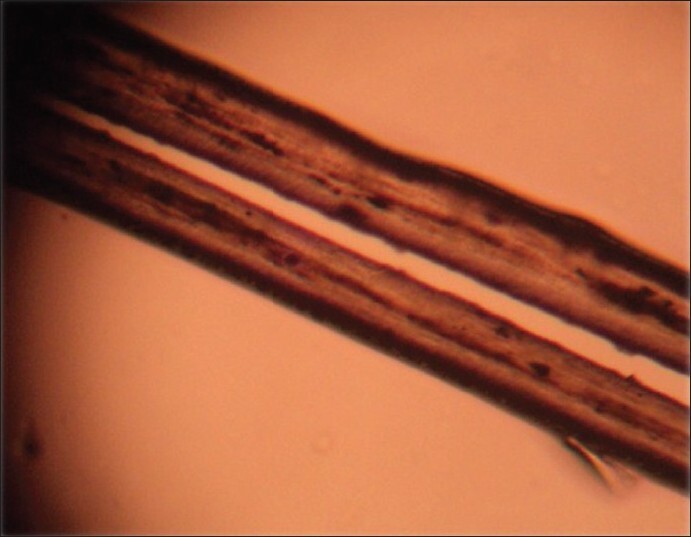 Hair microscopy of the shaft showed evenly distributed melanin granules of regular diameter that were bigger than those seen in normal hair [Figure 4]. 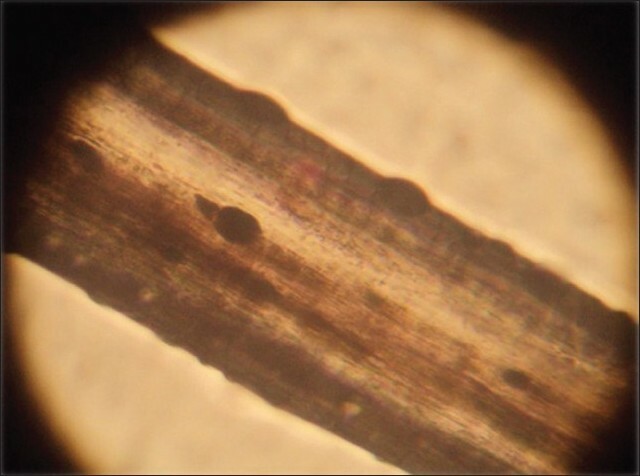 Polarized light microscopic examination of the hair showed bright shafts with different individual colors, resembling normal white hair [Figure 5]. Ophthalmic examination revealed brown eyes, patient complains of mild photophobia, fundus was normal, and ultrasound examination of abdomino-pelvis region was reported normal with no organomegaly. Skin biopsy of the target lesions of erythema multiforme over the back was consistent with that of histopathology of erythema multiforme. Edge wedge biopsy of the solitary plaque over the left infraorbital region clinically suspected to be basal cell carcinoma showed nonspecific histological findings of erosion of epidermis with chronic nonspecific predominantly perivascular inflammatory cell infiltrate with neovascularization. No evidence of malignancy or granulomas was noted. Based on these findings, a clinical diagnosis of CHS with erythema multiforme, mononeuritis multiplex, and sensory neural deafness was made. A 2-year-old boy, nephew of case 1, presented with recurrent episodes of distension of abdomen, fever, and vomiting since 1 year. He was admitted in the pediatric ward in the same hospital with high-grade fever and abdominal pain. On examination, this patient also had Silvery steel-like appearance of hairs all over the body. He had distension of the abdomen with hepatosplenomegaly [Figure 6]. Patient also had delayed milestones with growth retardation. On investigations, complete hemogram revealed pancytopenia. No prominent granules were noted in the leucocytes. Pediatricians advised diagnostic bone marrow biopsy for confirmation, but patient's attendees did not consent and discharged against advice. This patient could not be investigated further since the parents were not cooperative and unwilling. It was said that patient expired at home a week later. Exact cause for death was not known but postulated that it could be due to septicemia, as suggested by the treating pediatricians. Based on these findings, a provisional clinical diagnosis of GS was made. The main signs of dermatological interest in CHS and GS are generalized skin hypopigmentation at birth with tanning capacity after sun exposure, hairs with a unique silvery sheen, and more rarely, pigmentary dilution of the iris. This phenotype has been described as partial albinism. The disease usually enters an accelerated phase in childhood, with pancytopenia, hepatosplenomegaly, and lymphohistiocytic infiltrates in various organs. GS, characterized by reduced skin pigmentation, is often regarded as partial albinism and silvery grey hair combined with immunodeficiency. In our case, there was no history suggestive of hypopigmentation but photosensitivity and silvery hair were strikingly present, but could not be attributed as partial albinism. Familial consanguinity has been observed in 50% of the cases described in the literature; this finding was only detected in two families in a study by Carnide et al. The familial occurrence and silvery hair although was there in these two cousins being reported here, but with striking differences in other clinical manifestations and survival. Based on these differences, the diagnosis of CHS in case 1 and GS in the case 2 was made, with common presentation being silvery hair, which was the eye opener for the diagnosis. Though these syndromes with silvery hair manifest with overlapping clinical manifestations, some simple and electron microscopic investigations certainly aids in the differential diagnosis, as described in [Table 1]. The mean age reported in the literature for CHS is two years and six months, but there are reports of CGS being diagnosed in a two-month-old baby. However, for patients not submitted to bone marrow transplantation, the mean age of diagnosis has been 6 years, with only 25% of the patients being older than 10 years. Recurrent infections were the predominant clinical manifestations affecting the respiratory tract, these infections became more frequent closer to the accelerated phase and, they are associated with fever in this phase. Late diagnosis results in worse prognosis with a lower chance of indication for bone marrow transplantation. The diagnosis of our patient was made at the age of 12 years in case 1 and 2 years in case 2, indicating varied age of survival. It is understandable from this case report that the complications might set in as the age of survival increases, but interestingly, though there is evidence of recurrent infections in the form of fever and EMF, it has been milder with spontaneous resolution in case 1 with the diagnosis of CHS. But case 2 with the diagnosis of GS had recurrent episodes of severe infections with pancytopenia and finally succumbed to infection at the age of 2 years. Destruction of the giant melanosomes may dilute skin color. However, abnormal packing of normal-sized melanosomes into large lysosome-like structures in the epidermal cells may provide a more likely basis for the hypopigmentation. Near adolescence, about 85% patients enter the accelerated phase. The patients who live long enough may develop progressive neurological deterioration resembling spinocerebellar degeneration, characterized by pancytopenia, hepatosplenomegaly, and lymphocytic infiltrates into major organs, associated with fever, jaundice, and tendency toward bleeding. It has a ruinous prognosis and death generally occurs from infection or bone marrow failure. The diagnosis was established according to the following criteria: family history or consanguinity, occurrence of recurrent infections, partial albinism, and detection of giant intracytoplasmic granules in leucocytes and/or marrow aspirate. Other laboratory tests were done according to clinical conditions such as serology for virus (ebstein barr virus/cytomegalo virus), evaluation of hepatic function, among others. Prenatal diagnosis is possible by demonstrating characteristic CHS cells in cultured chorionic villi cells as seen in experimental animals. In this report of two cases, there was history of consanguinity with other reported feature except partial albinism and giant intracytoplasmic granules in the leucocytes, which may be the cause for less severe infections and longer survival of 13 years at present in case 1. The diagnosis was confirmed after the detection of intracytoplasmic granules in the leucocytes and/or bone marrow aspirate. However, we could not demonstrate the granules but could come to a diagnosis based on other clinical and investigative findings with striking presence of silvery hair and reported microscopic findings of the hair shaft. There are several reports in the literature, on CHS and GS, with marked variations in clinical presentation, investigative findings, and mean age of diagnosis and survival. There have been individual case reports with association of other feature like partial oculocutaneous albinism and sensory neural deafness. To the best of our knowledge, there are no previous reports in English literature suggesting CHS with Erythema multiforme and sensory neural deafness. 1. Bellinati-Pires R, Araujo MIAS, Grumach AS. Deficiências do sistema fagocitário. In: Carneiro-Sampaio MM, Grumach AS, editors. Alergia e Imunologia em pediatria. 1st ed. São Paulo: Sarvier; 1992. p.165-6. 2. Valente NYS, Machado MCMR, Boggio P, Alves ACF, Bergonse FN, Casella E et al. Polarized light microscopy of hair shafts aids in the differential diagnosis of Chédiak-Higashi and GriscelliPrunieras syndromes. Clinics. 2006;61:327-32. 3. Zelickson AS, Windhorst DB, White JG, Good RA. The Chidiak-Higashi syndrome: Formation of giant melanosomes and the basis of hypopigmentation. J Invest Dermatol 1967;49:575-81. 4. Carnide EMG, Jacob CMA, Pastornio AC, Bellinati-Pires R, Costa MBG, Grumach AS. Chediak-Higashi syndrome: Presentation of seven cases and literature review. Rev Paul Med. 1998;116:1873-8. 6. Wang N, Wu WL, De Lozanne A. BEACH family of proteins: Phylogenetic and functional analysis of six Dictyostelium BEACH proteins. J Cell Biochem 2002;86:561-70. 7. Sanal O, Yel L, Kucukali T, Gilbert-Barnes E, Tardieu M, Texcan I, et al. An allelic variant of Griscelli disease; Presentation with severe hypotonia, mental retardation and hypopigmentation consistent with Elejalde syndrome (neuroectodermal and melanolysosomal disorder). J Neurol 2000;247:570-2. 8. Cahali JB, Fernandez SA, Oliveira ZN, Machado MC, Valente NS, Sotto MN. Elejalde syndrome: Report of a case and review of the literature. Pediatr Dermatol 2004;21:479-82. 9. 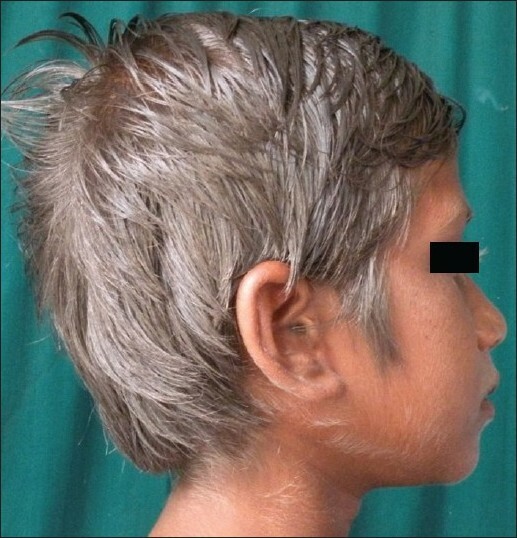 Inamadar AC, Palit A. Silvery hair with bronze-tan in a child: A Case of Elejalde disease. Indian J Dermatol Venereol Leprol 2007;73:417-9. 10. Ward DM, Shiflett SL, Kaplan J. Chediak-Higashi syndrome: Clinical and molecular view of a rare lysosomal storage disorder. Curr Mol Med 2002;2:469-77. 11. Usha HN, Prabhu PD, Sridevi M. Chediac-Higashi syndrome. Indian J Pediatr 1994;31:1115-9.